This started out as a simple project, and has morphed along the way. I will save you all the changed decisions and just give the basics. 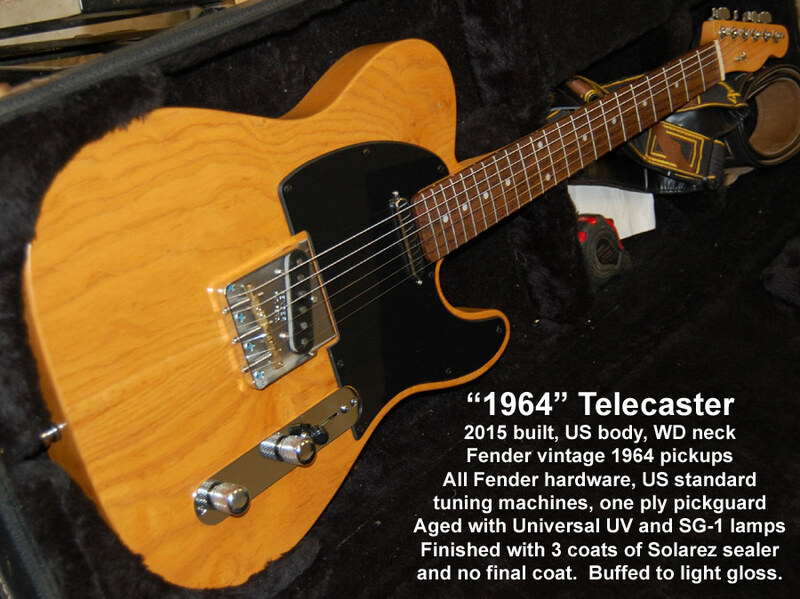 The goal was to create a 1964 Fender Telecaster like guitar, something that would sound just like the original, and look old, very old, but in mint condition. I did this using as many US made parts as possible, and I logged a lot of time in the UV aging booth. I got to do some experiments with Solarez's new wood sealer, which is closer to something between a sealer and a final finish than most sealers, so I just used three coats and called it a day with the finish. The main photo here is the actual image from eBay when I bought the body. As you can see, there are some imperfections in the body, little swirls that had to be filled. Small, but they are there. This is part of what I liked about it, it looked real, and the bookmatching of this two piece body is really well done. 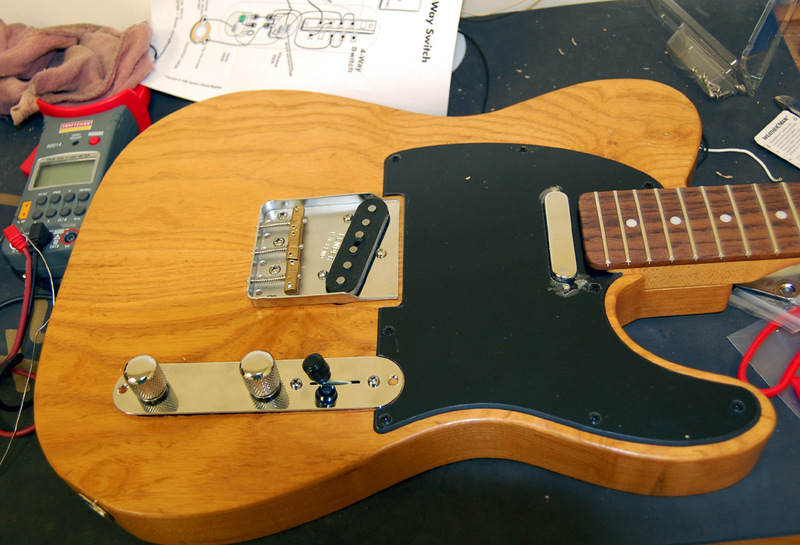 Other than having to drill two holes in the neck pickup cavity to allow for the longer screws of that pickup, and obviously the holes for the pickguard and control cavity, I didn't have to do any cutting and everything matched up, so from a technical point, it was a great body. I think I paid around $130-$140, which I thought was a steal. 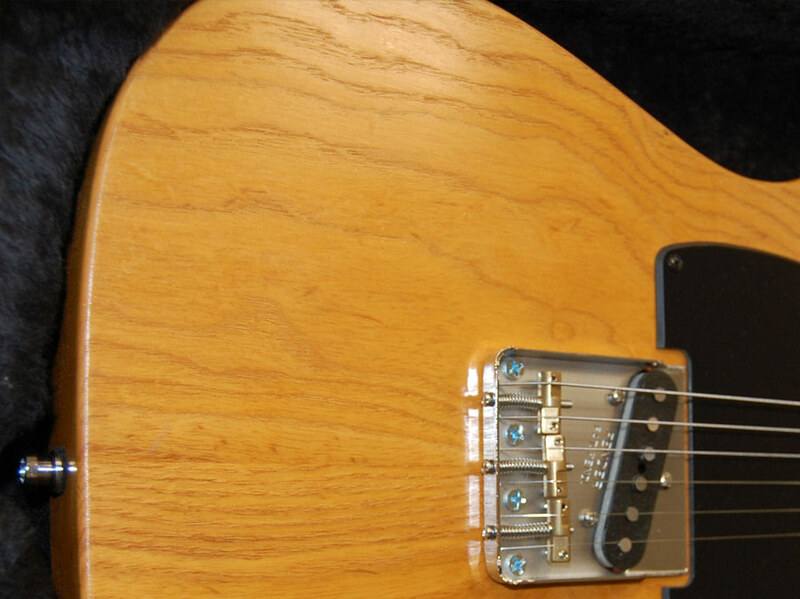 * Fender Vintage 1964 Telecaster pickup set. 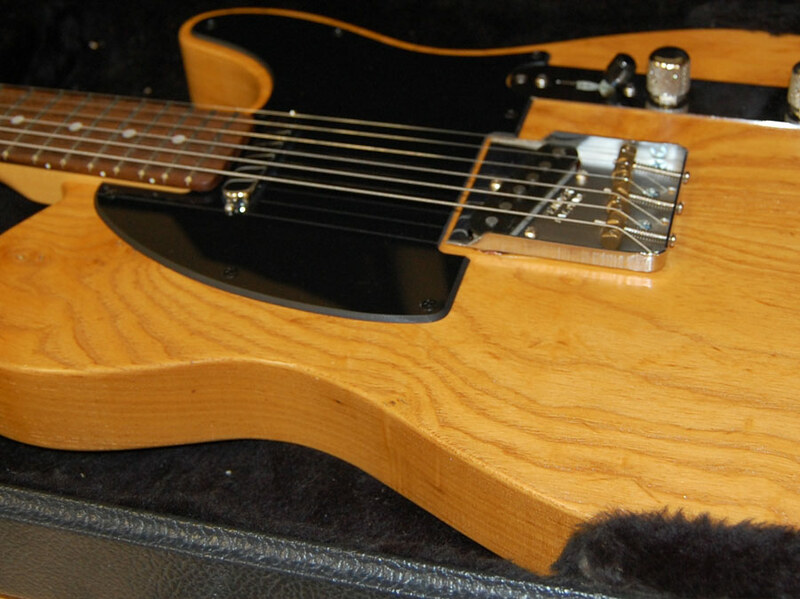 * Fender single ply pickguard, vintage bridge and hand built control system. * Fender US modern tuning keys. * Electrosocket, Switchcraft jack, "custom made" neck plate. I'm not sure what I have all into it, it's hard to calculate, but probably in the $600-$700 range, which is pretty good for a US made guitar with Fender Custom Shop pickups. I scouted around and found deals where I could, I didn't just go shopping and blow a wad for the project, but you could do the same with just a little patience. 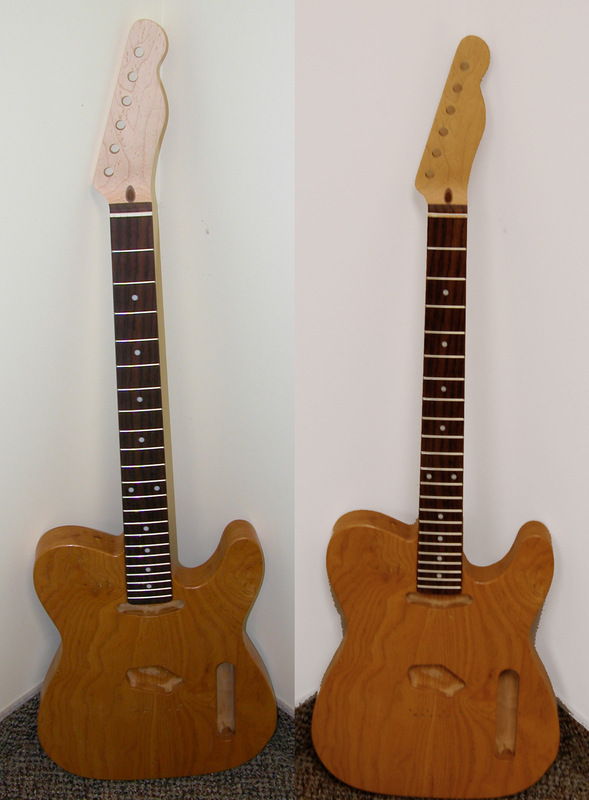 This shows the guitar on both sides after aging the wood for about 6 days at low power (32 watts into a 40-60w lamps). It can be done faster, but this was the rig I had available when it was time to age it, so it is what I used. I used six SG-1-40 lamps for the face and two Universal UV lamps for the sides, flipping the guitar daily for a total of 6 days per side. Low tech, but effective enough. At this stage, I had also put on some sealer, which is almost clear (a slight blue tint to it), which "wetted" the wood and brought out the dark color even better. I ended up using 3 ultra-thin coats of the sealer, buffing between each coat, and only sanding my drip boo boos, which were few. You have to remember, I'm a self-admitted idiot when it comes to finishing guitars, my specialty is playing and obviously designing UV lamps. Like the neck, this body will continue to naturally age over the years. Guitars with thin finish won't, only the finish will age, but this allows enough oxygen and UV to continue to penetrate that it will look better each year. Another thing worth mentioning is that a clear finish is better than a "tinted" finish because those tinted finishes are suspending particles in a clear medium, blocking the view of the grain. Photos don't do it justice, but if you see this up close, you can see not only the grain, but the depth of grain since it isn't a perfectly flat finish: where the grain is darker, it is a fraction deeper as well. This makes the guitar look real, natural and begs to be picked up and played. 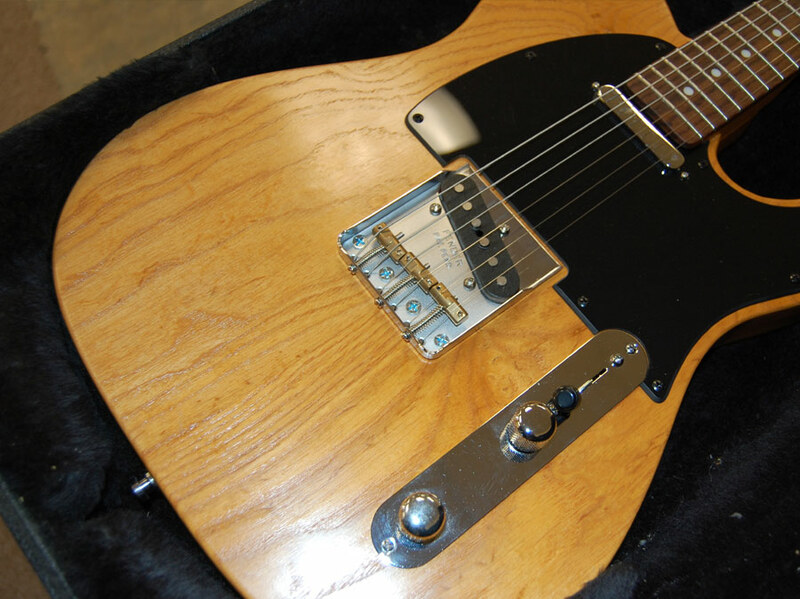 There is unquestionably a more organize feel to this Telecaster compared to an off the shelf cookie cutter guitar. Put them side by side, and this one doesn't look like a copy of a 40 year old piece of wood, it looks like REAL 40 year old wood because we didn't add tint, we simply compressed time and gave it the kind of oxidation it would normally get from from being 40 years old. Again, the bookmatching was done very well on this body. I was afraid once we started finishing, we would get that double slab look, but the two pieces match up perfectly. You can click on the image for a bigger version, it will open a new window. This was pretty simple, I just put the neck under the lights for about 3 days on each side. 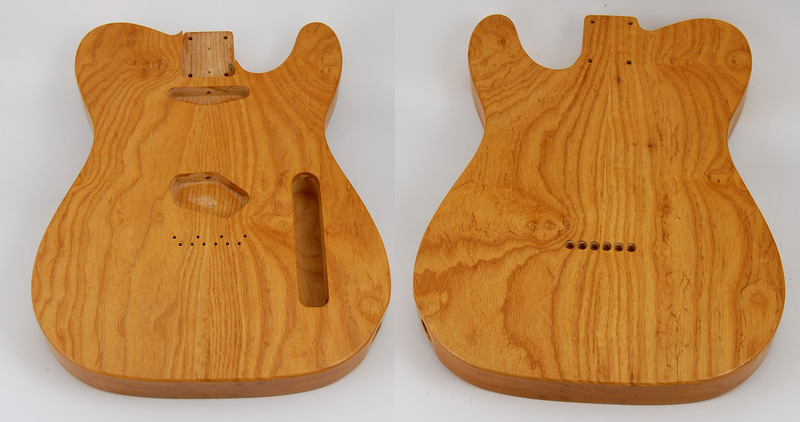 The neck doesn't have a regular finish, it has a sealer coat and that is how I expect to keep it. If I manage to wear that off, I will just steel wool the thing and reseal it. 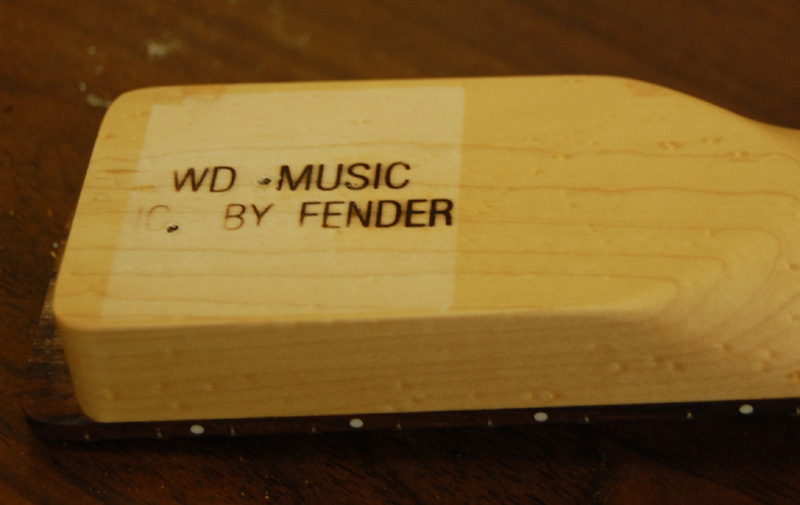 I like the way a guitar neck feels when it is only sealed, no glossy/sticky finish to slow you down. I left the tag on the guitar neck while I aged it, then removed it to take this photo, giving it a bit of a "tan line" so you can easily see the before and after. Without question, this gave the neck character and warmth. As an added bonus, it doesn't look fake like the orange tinted "vintage finish". Those actually suspend orange particles between you and the wood, so they hide the grain a bit. Doing natural aging doesn't, it lets the wood shine through. More importantly, the wood will continue to age naturally because it isn't being covered up by a layer of particles and goo, so it will look better as the years go by and it naturally oxidizes. The neck isn't "authentic" in any real way, as it has 22 frets instead of 21, a 12" radius instead of 7.25" or even 9.5", a TUSQ nut instead of bone, no skunk stripe on the back, but I like it. Most of my guitars are 9.5" medium "C", so this is different. I don't know if I like it better, but I like it plenty and have no desire to trade it out. I bought it from Atlantic Custom Guitars. The owner is about retired but still sells parts, including Fender licensed necks where he levels the frets and installs a notched TUSQ nut and does it for under $150. I paid full price for the neck, but impressed enough that I would send friends to him, at http://guitarparts.guitars/. I had trouble getting the colors to match up here, going photography under office lights instead of the studio, but you still get an idea of the difference that aging the head stock makes. The neck looks more natural with this body, like they are of similar age. The new, very white looking wood just didn't cut it, and was very out of place. Now they match up nicely. Note that it is pretty easy to age plain wood, or through sealer, but aging through a full finish is trickier. Some finishes are UV filtering, so your mileage will vary. You just have to try and see, keeping in mind it takes a few days to see results even under the best of circumstances. Again, just click on an image and it will open up a larger photo in a new window. I know, this has nothing to do with UV, but I've added a few images just to show you the process. 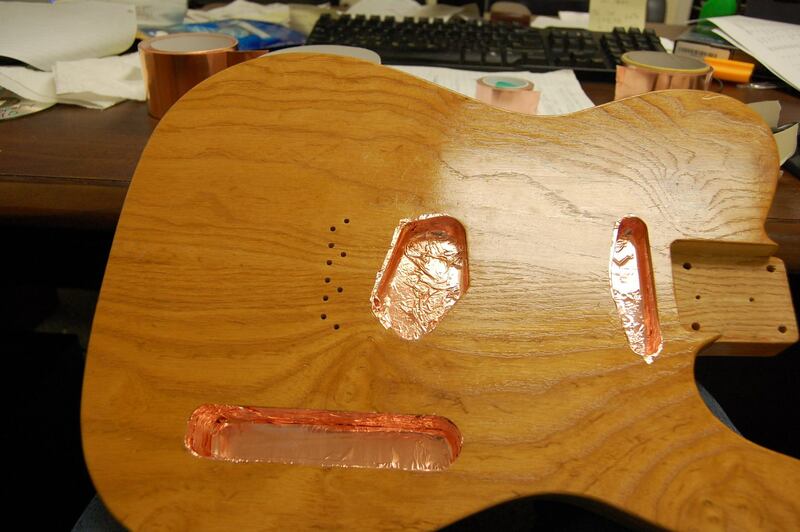 Some people reading this are just into building Telecasters and not into UV, and I want to help them out as well. It also shows the guitar from a few different angles, as cameras tend to lie a little and the office lighting is kind of yellow here. 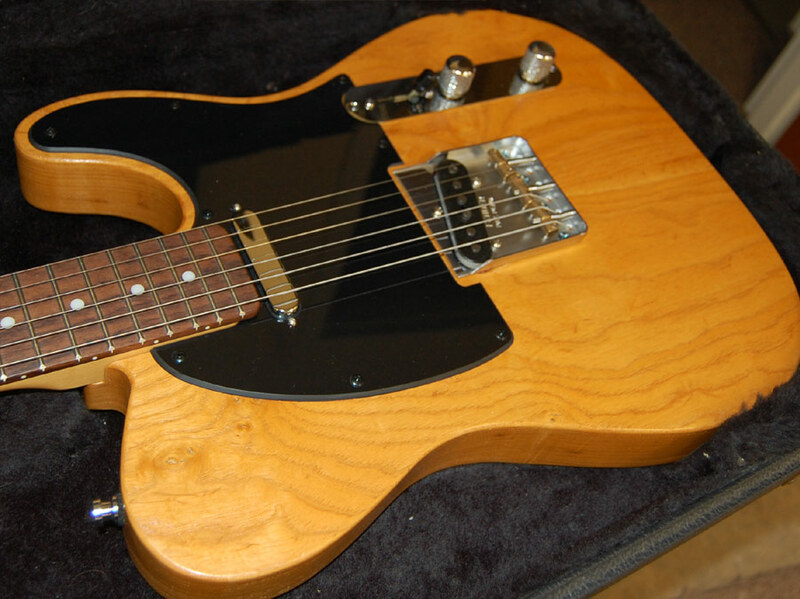 I did cheat a little, used compensating brass saddles and notched the bridge to suit my playing style, but the overall feel, look and sound is very much like an authentic 1964 model, with lots of body and bright edge. I only used three coats of Solarez wood sealer with no actual finish, so you can see and feel the wood grain. 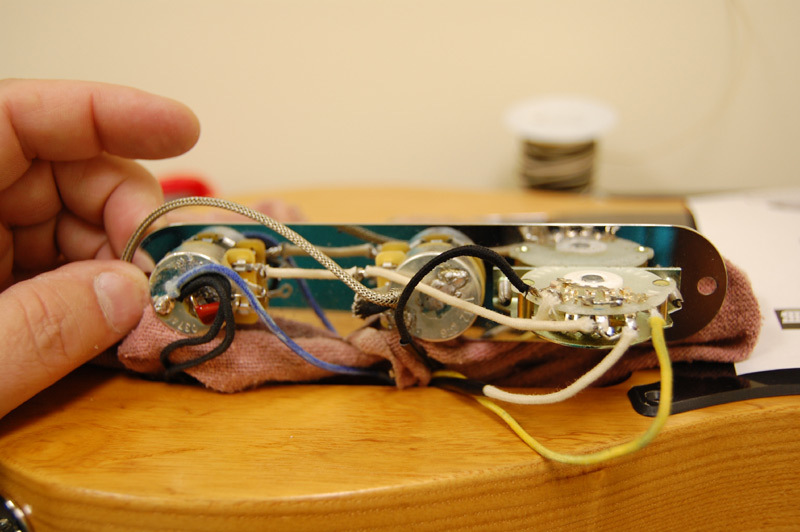 This makes the body resonate like crazy, and gives the guitar a very organic feel to it. Walking up, it looks like a closet classic, a very old guitar that was never played and kept in perfect condition. This was the goal. What looks like drip marks aren't. 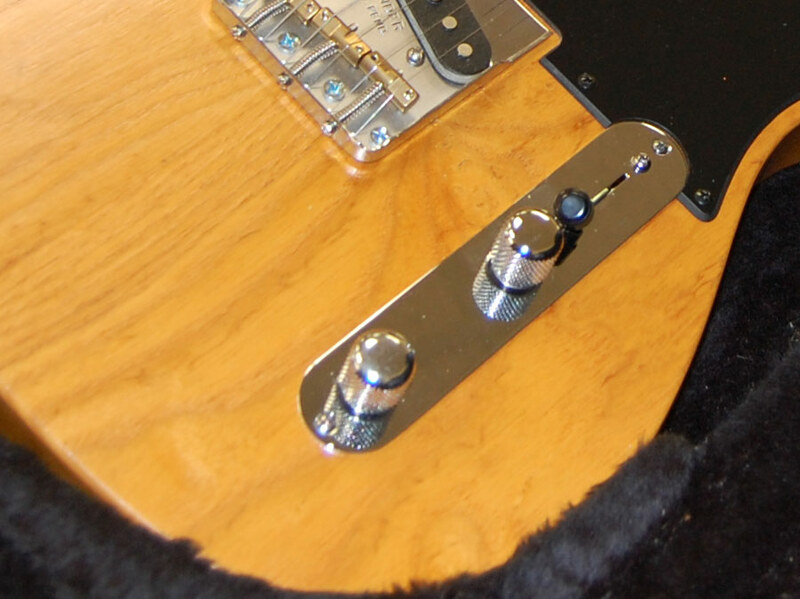 those are pin knobs that are on the edge of the guitar, and are just visible due to where the cut in the body was made.